A Select From Relation (From Relation for short) is used to specify the name of a Table or View in the FROM clause of a Select statement. A Select From Relation is a Relation in which the child is a Select object (which is owned by a View) and the parent is a Table or View. In ModelRight, a View can be composed of several Selects (combined using some operator, like UNION). 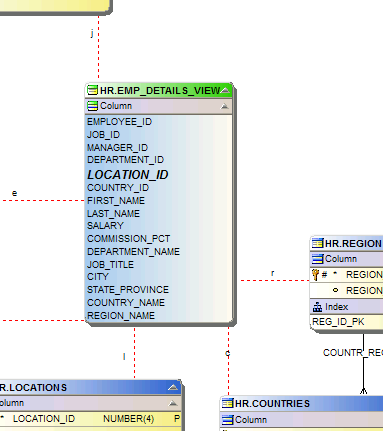 Select From Relations are represented in a Diagram with a Select From Graphic object. A Select From Graphic Template is provided so that you can easily change the appearance of all Select From Relations. You can toggle the display of all Select From Relations in the Diagram's Relation Display Options Property Page. You can also toggle the display of any individual Relation by selecting the Relation, then selecting the Graphic tab in the Property Browser, and toggling the Display checkbox. This screenshot shows a view with a number of From Relations. By default, From Relations are drawn with a red dotted line.